This installment of the Cultures of Celmae-series clocks in at 18 pages, 1 page front cover, 1 page editorial, 2 pages of SRD, 1 page back cover, leaving us with 13 pages of content, so let’s take a look! The early history of Celmae’s orcs is shrouded in history, as they were bred from the desire for conquest of the deity Rullux – their fecundity bestowed upon them as a present by the Black Goat Shub-Niggurath, they went to war against the giants, though other origin stories place them as twisted children from the woods – in this origin story, the orcs created pyramidal structures and suffered the inevitable collapse that grand empires falling to decadence ultimately go through – at least, this would explain the evocative prose depicting the ancient lost orc temples, monuments to times long past. As the cataclysmic Shattering wrecked Celmae, the orcs engaged in a horrid war with the newcomer elves, one that was waged for over a 100 years before the orcs had to concede defeat and retreat to the sea in 112 after the Shattering – and on the waves, the orcs stole ships, built up their armada and adapted…while those remaining in Brynndell took to the caves, often falling prey to the horrid realities of slavery they had once imposed upon the pink-skinned humans. The two deities with most influence on the orc people, Rellux and Shub-Niggurath, receive their respective full deity write-ups – as a minor complaint, shubby gets two favored weapons, which can provide minor hiccups in the favored weapon ability-based interaction. That being said, the write-ups per se are nice. The pdf also provides a kind of “nation” – the Red Tens of Nasph – on the edge of the Shadowlands Desert, once enslaved by the Necrophites, a vast organized (as far as you can call orcs organized) force exists – the Bloody Army, and one forward camp of this vast host has been provided for your convenience. The pdf also provides the full stats of Koruv Nasph, the favored of Rullux, has his eye on expansion – but he may be up for a rude surprise when he tries to take the lands of the hobgoblins. The stats for this NPC have been provided – he clocks in at CR 13 and is a spelleater bloodrager 13. The statblock has some minor issues, but is better than most I have seen from Wayward Rogues Publishing. Now, racial trait-wise, the orcs of Celmae generally are the standard orcs, but have the Dayrunner racial trait built into their standard. The pdf also sports an alternative version of the race, the ashen orc, who gets +4 Str, -2 Int, Wis and Cha, +2 to saves versus diseases and mind-influencing effects, ferocity, orc weapon familiarity, darkvision 60 ft., light sensitivity and negative energy affinity. Furthermore, they take no penalties from energy drain (he may still die) and after 24 hours, these are automatically removed. While just as lopsided as the regular orcs, that’s a design decision that was not made by Wayward Rogues Publishing and hence, I won’t penalize the pdf for it. The ashen orcs, while strong in undead-heavy campaigns, make sense as tied to the Ashen King and generally can be considered to be a flavorful alternative – if you allow regular orcs, these only represent a minor and situational power-increase, so no complaints on my end. The pdf also contains 4 new archetypes, the first being the Blood-Wielder bloodrager. Instead of bloodline powers, these guys get Blood Weapon at 1st level: The orc can damage himself for 1 point of bleed damage – if already bleeding, he does not need to activate the ability thus. Unfortunately, the pdf does not specify what kind of action this self-inflicted damage is. Once bleeding, as a swift action, the blood-wielder can form blood into 10 pieces of ammunition, 5 light throwing weapons, 2 light one-handed weapons or one two-handed weapon. Oddly, RAW, regular one-handed weapons can’t be created. The blood-wielder can only create weapons he is proficient with and the weapons shatter when disarmed, dropped or sundered, but are considered masterwork quality. As a nitpick, this needs to specify the material the weapons are supposed to be for proper sunder interaction. At 3th level and every 4 levels thereafter, these blood weapons gain a “magical +1 bonus” – I get what this tries to do, but unfortunately, the wording, while understandable, is not precise enough. Instead of 2nd level’s uncanny dodge, the bloodrager no longer has to charge in a straight line while charging – only the final two squares must be in a straight line. However, the additional sentence “and the bloodrager must take the most direct path to the target” is weird – if he has to take the most direct path, he can’t charge in fancy movement either, avoiding hazardous terrain etc., which severely limits the use of this ability – considering how lame blood weapon-benefits are, that’s disappointing. At 3rd level, the archetype gains an untyped +1 bonus to saves (should be typed) for each point of bleed damage he takes a round and at 7th level, also DR. Problem: That bonus should have a hard cap to avoid seriously broken bonus-cheesing. This replaces blood sanctuary and alters damage reduction. Instead of improved uncanny dodge, the blood wielder may cast spells with somatic components while having a weapon in his hands or being grappled – sans making a concentration check. Which is pretty insane. Why not provide a massive bonus instead? The Scar-Speaker skald loses armor and shield proficiency and versatile performance, but gains +2 natural armor that increases by 1 every 3 “character levels attained” – that should be class levels. They get +1/2 class level on Knowledge (History) and Intimidate checks instead of bardic knowledge. Raging Song is modified to behave slightly differently – to gain its benefits, you have to be able to see the scar-speaker beginning the scar-story. Starting it is a standard action, maintaining it a free action. RAW, 7th level and 13th level can make problems: They change activation to move and swift, respectively, and don’t include the caveat of choice. Also at 7th level, the skald may 1/scar-story let all affected allies reroll a saving throw. The archetype loses lore master and gains Intimidating Prowess (feat not properly capitalized) at first level instead of Scribe Scroll. The skull-splitter barbarian gains immediately the benefits of rage upon being reduced to 0 HP until brought above 0 hp. Additionally, he may expend a round of rage to remain standing when he’d be killed – which is cool. However, how does that interact with save-or-die abilities while raging thus? Immune? No idea. This needs clarification. It replaces uncanny dodge, btw. Instead of 2nd level’s rage power, these guys may use Dexterity instead of Strength to meet the prerequisites of feats based on TWF…which makes no sense! It should be the other way round! How that could get past cursory inspection, I have not the slightest clue! Also: Attributes are capitalized. TWF-based feats may also be chosen as rage powers. At 3rd level, the archetype can deal 1 point of damage to the weapon to deal +2 points of damage to the target. This increases at 6th level and every 3 levels thereafter. Urgh, really? A) Action? To how many attacks does the bonus damage apply? Also “may deal damage to his weapon to deal 2 additional points of damage to his target” is NOT rules-language. How does that work with ranged weapons? Not starting with the issue that this ability shows a basic ignorance of how DAMAGING OBJECTS IN PFRPG WORKS. Hardness, anyone? URGH. 5th level yields head hunter – the option to make a fetish from a fallen foe that occupies a belt, body, chest or shoulder slot. “A single skull fetish may house two one-handed weapons or a single two-handed weapon.” So is it a sheathe?? The archetype gains Improved Critical (not properly capitalized) when wielding a weapon sheathed in the fetish. Drawing them from the fetish is a free action, but deals 1 point of damage to the fetish, which has 10 hit points and hardness 0. So the author did know what hardness is, I guess. This replaces improved uncanny dodge. I kinda like the last ability, in spite of its issues. The final archetype is the war-shaman, who is locked into the battle spirit at 1st level, but the archetype does gain +2 natural armor. He does lose spirit animal, though. Instead of spirit magic, the archetype chooses one weapon: She gains proficiency with it and uses her total HD instead of BAB for CMD while wielding the chosen weapon. At 4th level, wandering spirit is exchanged for the option to, as a standard action, choose a combat feat for which she meets the BAB-prerequisites (but may ignore others), gaining the “special benefits” of that feat for one round per class level. I…get what this tries to do – the wording is sunk by “Special”, which is a loaded term for feats that pertains to additional considerations and would, RAW, render the ability useless. 12th level provides 2 combat feats and increases duration to 1 minute per class level; 20th level nets 3 feats for a whole day. Sooo…how often can the ability be used? For, if it does not have daily uses, the final ability may actually mean a significant decrease in flexibility, which would be weird for a capstone. Starting at 6th level, as a standard action, the shaman can grant herself and an ally within 30 ft. the teamwork feat for 1 round per class level. Only the shaman must meet the prerequisites. 14th level lets the character share the feat with all allies within 30 ft. This replaces wandering hex. While not perfect, by far the best archetype herein. Editing and formatting, weirdly, are mixed, but in a different way than usual: The formal component is not perfect, with quite a few its/it’s-typo level glitches. Rules-language shows the different skill-levels and lack of a controlling dev/editor, oscillating between pretty good…and not so much. Layout adheres to Wayward Rogues Publishing’s two-column full-color standard and the pdf offers some nice artworks, though some of them I’ve seen before. The pdf has no bookmarks, which constitutes a comfort detriment. Additionally, copy-pasting of text is disabled, which is just plain annoying when trying to parse text for a character in actual play. As before, I will rate this as the culture-sourcebook it is, not as a pure crunch-book: If you’re looking for crunch, avoid this, unless you have the time and nerves to fix the mess of the archetypes. 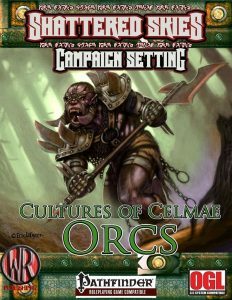 If you’re looking for dressing, information on the orcs in Celmae, however, you may actually get something out of this inexpensive pdf. It is due to the low price and the cultural information I am going to round up from my final verdict of 2.5 stars. You can get this installment here on OBS!